Plasma anandamide (AEA) levels fluctuate throughout the menstrual cycle and in early pregnancy in a pattern suggesting its involvement in implantation and early pregnancy maintenance through mechanisms that might involve its binding to cannabinoid receptors CB1 and CB2. Plasma AEA levels are maintained by the actions of the enzymes fatty acid amide hydrolase (FAAH) and N-acylphosphatidylethanolamine-phospholipase D (NAPE-PLD). All of these component parts of the ‘endocannabinoid system’ have been demonstrated in rodent but not in human uteri. This study aimed to demonstrate the presence of the endocannabinoid system in the human uterus and catalogue its modulation. 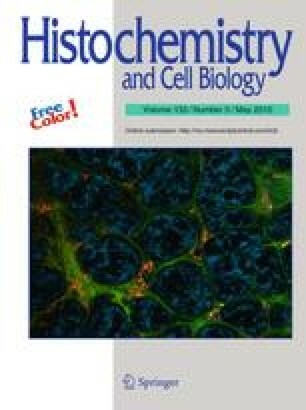 Immunohistochemical techniques were employed to localise and determine the distribution of immunoreactive CB1, CB2, FAAH, and NAPE-PLD in well-characterised menstrual cycle biopsy samples. Immunoreactive CB1 and CB2 were widely distributed throughout the uterine tissue. In the myometrium and endometrium, smooth muscle cells were immunoreactive, although the vascular smooth muscle cells in both tissues were more so. In the endometrium, CB1 and CB2 immunoreactivity was primarily restricted to the glandular epithelium and expression was unrelated to the phase of the cycle. FAAH immunoreactivity in the endometrium was highest in the mid-proliferative gland and mid-secretory stroma, whilst NAPE-PLD immunoreactivity was down-regulated in the secretory epithelial gland compared to the proliferative epithelial gland and unaffected in the stroma. These data indicate that elements of the ‘endocannabinoid system’ coexist in many cell types within the uterus and may provide insight into the sites of action of endogenous and exogenous cannabinoids during endometrial transformation. The authors thank Mrs Susan Spurling for cutting the sections, Dr Lawrence Brown (Gynaecology Histopathologist, Pathology Department, Leicester Royal Infirmary, Leicester) and Dr Suha Deen (Consultant Histopathologist, Pathology Department, Queen’s Medical Centre, Nottingham) for accurate dating of the biopsy samples. This work was funded in part by the BUPA Foundation and by the Reproductive Sciences Section, University of Leicester.